We recommend wearing proper safety equipement when spraying foam. You might consider purchasing our safety kit. This product typically qualifies for $42.00 in energy tax credits. 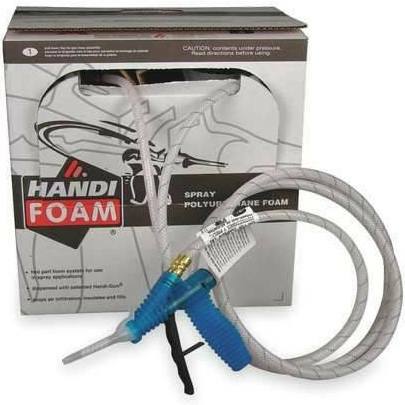 Handi-Foam™ Low Density Spray Foam is an open cell spray foam designed to fill and insulate, deaden sound and reduce vibrations in larger cavities. 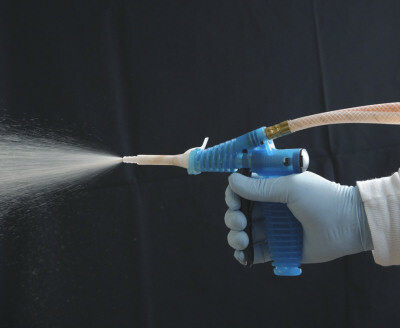 The low density polyurethane foam is dispensed using the patented Handi-Gun™ dispensing unit for accurate and precise applications. Due to its excellent adhesion properties, Handi-Foam™ low density foam insulation provides an excellent insulation by creating a continuous air barrier that completes the building envelope. This helps improve indoor air quality, lowers heating and cooling costs and drastically reduces energy consumption. Handi-Flow assist in attaining ENERGY STAR™ rating and/or LEED credits. Handi-Foam™ is designed utilizing a non-flammable blowing agent to assist in the safety of the end user. Handi-Foam™ spray foam, sealants and adhesives contain no Formaldehyde, CFC™s or HCFC™s. This product contains no VOC™s. Perm Rating: 31 at 1 in. Temperature: Spray foam products are temperature sensitive. You can spray this kit in colder outdoor temperatures; the key is to keep the core temperature of the tanks within the proper range of 75-85°F. Shake Well: Prior to using this kit, the canisters must be shaken well. One way to acheive this with the larger kits is to remove each tank from its box and roll back and forth on one edge for at least 2 minutes. Change Nozzles: It is important to change the nozzle after you stop spraying for more then 30 seconds. Failure to change nozzles may result in damage to the spray gun. Reuse Nozzles: It is possible to clean and reuse a nozzle 2-3 times. As soon as you are done spraying, remove the nozzle and drop it in a can of acetone. You can also use our Handi-Cleaner to clean out uncured foam. Speed & Distance: Keeping the gun 12-18 inches away from the surface and moving the gun at 1 foot per second will produce 3" thick foam. 3" thickness is typical for Open Cell foam, and typically produces the best yields. Highly skilled professionals may be able to produce foam at 2 inches or even 1 inch thickness. Thickness: 3" thickness is typical for Open Cell foam, and typically produces the best yields. Highly skilled professionals may be able to produce foam at 2 inches or even 1 inch thickness. Safety Considerations: Our Safety Kit includes a tyvek suit with hood, respirator, goggles, and 2 pairs of gloves. Clean Up: You can clean up uncured foam with Handi-Cleaner. Once foam is fully cured, you will have to remove it by mechanical means. While each kit come with everything you need to spray foam, you may be interested in some of these optional accessories. *Board foot is a square foot with 1 inch thickness (12"x12"x1"). Product yield dependant upon proper core temperature. Single spray foam kits typically cost less to ship via UPS. Two or more large soundproofing foam insulation kits typically cost less to ship via LTL Freight service. All shipping options will be provided during checkout. Note: Use this sound deadening spray foam product only according to the manufacturer's written instructions.